It’s been over a week since I last posted, whatever has been happening? 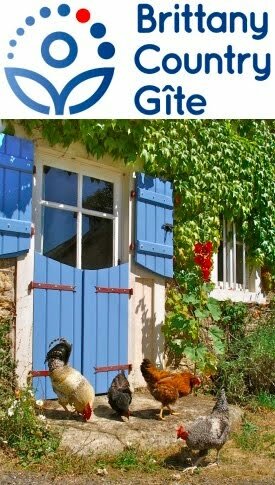 A visit from venerable parents, putting the final touches to a complete re-write of the website for our holiday gite and building a new set of stairs out of some reclaimed wood (more on that soon). Oh, and a silly football competition called Euro 2008, which our baker (boulanger) Jacky, and even more so his son Alexi, have been ribbing me about for ages because England didn’t even qualify. The French got knocked out in the first round, which could have meant I was living in “Gloat-ville” but, do you know, I’m really not that sort of guy. In fact it was just like supporting my own national team in that they promise a lot, then let you down. So I supported the Dutch, who play in a snazzy orange strip and they promised loads then got beat by the Ruskies, quelle tristesse! 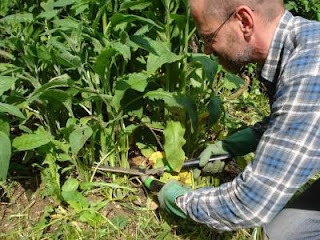 What a load of old nonsense and no excuse at all for delaying telling you, via your favourite permaculture blog, everything you ever wanted to know about Comfrey, but were afraid to ask. Why comfrey? Have you ever wondered why useful plants are usually delicate creatures, yet weeds just thrive, without any care at all, and pondered wouldn’t it be wonderful if there was such a thing as a useful weed? Comfrey is it. Its deep tap roots mine the soil of nutrients, filling its leaves with minerals such as the holy trinity of plant food, nitrogen, and phosphorous and potassium, along with calcium and iron. It remains only to harvest it and make a comfrey “tea” (concentrate) to use as a plant food, use it as a mulch and even feed it to animals. Which comfrey? Wild comfrey (Symphytum officianale) will spread … like a weed. So you should use the “Bocking 14” cultivar (Symphytum x uplandicum) of Russian comfrey, which contains more of the useful minerals whilst producing almost no viable seed, so it stays where you put it (rather than spreading everywhere and taking over). When and how to cut comfrey? Use ordinary hedge trimming shears and chop it off 5cm (2 inches) above the ground. Think about wearing gloves as the bristles can irritate your skin. Cut in spring, when the plants are around 60 cm (2 feet) high and before flowering stems develop. Once the plant is well established—I’d give the plant a year to settle in before you start harvesting leaves—cut every time the plant reaches 60 cm (2 feet) high and before flowering stems develop and you should get several cuts a season. At the end of summer, stop cutting, letting the plant grow on and build up its strength to see winter through. Tomorrow, I’ll tell you how to propagate comfrey (remember, Bocking 14 doesn’t produce seed) and how to make comfrey tea. 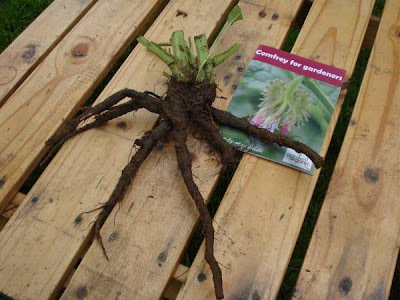 A big mention for the excellent booklet Comfrey for Gardeners published by Garden Organic (Henry Doubleday Research Association). I was going to buy some comfrey from Ragman's this spring, but they've stopped selling it. How about you sell me some divisions this autumn? ?